TheProtected content is a big botanical garden with an area of 43 hectares and around 22,000 different plant species. It was constructed between Protected content 1910, under the guidance of architect Adolf Engler, in order to present exotic plants returned from German colonies. Since it is cold outside we will tour the many glass houses that will take us to a lot of different plant regions of the world. 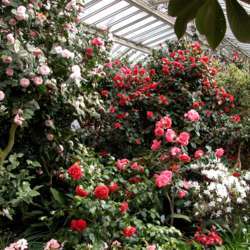 Moreover it is high season for camellia to flower and the respective glasshouse is full of flowers which is not to be missed, I believe.